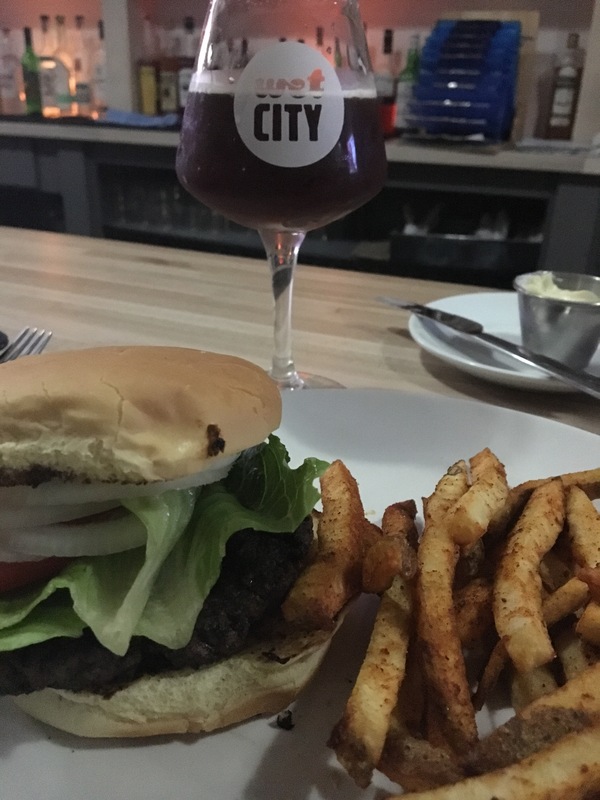 Wet City – eating my way through Charm City! I really enjoy Wet City; it has a modern vibe but a welcome neighborhood feel, with the bar team in t-shirts and jeans. After just a few visits, I am welcomed like an old friend. Even though it’s in that kind of weird part of Mount Vernon that can be a little tricky to get to, there are so many great things happening here. I expected to find new things at a bar named after Maryland’s refusal to adhere to those crazy prohibition rules. First, from the moment you walk up – guided by the neon blue sign like a lighthouse beacon. I love how bright the place is – LED lights and white walls with a slightly pink wavy lines that mirror the flow on their tees. There might be a slight Ikea style flair happening here, but I like the clean lines; they create space so you don’t feel crowded while you’re perusing the menu. Since I prefer sitting at the bar, the beer menu on the board behind the taps often catches my eye. Their 20 tap beer selection changes regularly. It’s possible to come every week and have new choices. My favorite part about their menu is the smiling and sad face stamps as the kegs get kicked and new ones come on-line. 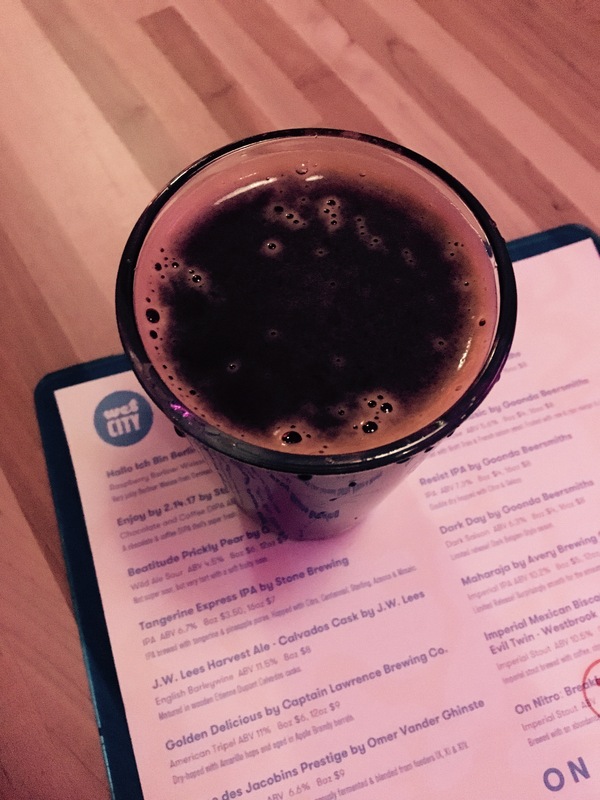 This spot is fantastic for folks who aren’t sure if they like beer or who are ready to try new ones, as you can get any of their taps in two sizes. I had no reason not to expect good things about the food, although I have been struggling to find a bar with great drinks, friendly bartenders and bar crowd and good food. 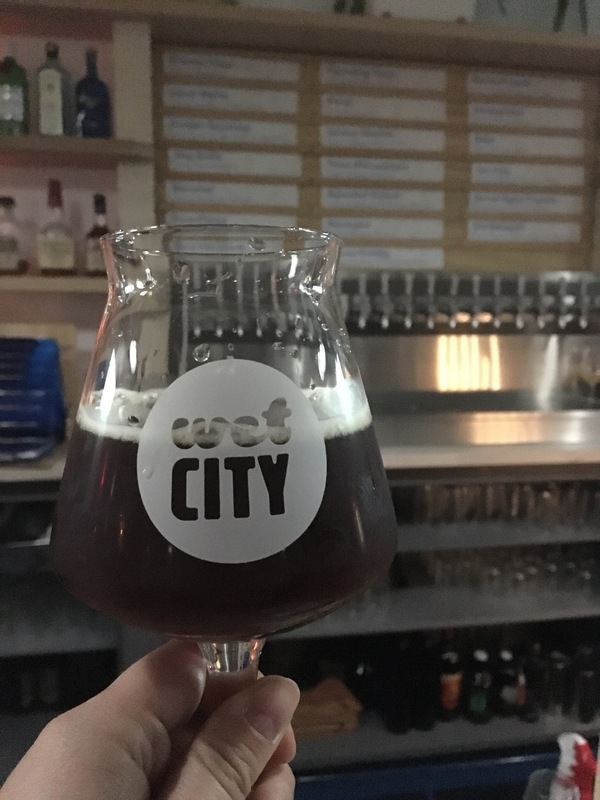 Turns out – Wet City is that bar. They have a smaller burger on happy hour for about $8 and it comes with fries. It’s a great deal and only the beginning of the culinary experience at Wet City. The menu has a good mix of small sharable snacks like fries and popcorn, but also has entrée sized dishes and fun specials like this duck confit. The beautifully tender meat under this crispy duck skin made for a great bite. The richness of the game bird was complimented with the pickled onions. This was a well-balanced dish. Sometimes they even host local pop-ups – like when Local Fry stopped in a made some Korean inspired dishes like these gochujang wings. Crispy skin slathered with a stick-to-your-fingers sauce made these spicy wing just what I wanted. If the current status quo is any indication, I cannot wait until they are brewing their own beers on site. This entry was posted in Charm City. Bookmark the permalink.